VADs – What are they? Visual Alarm Devices (VADs) are an essential component to most fire alarm systems. They provide a visual indication of an alarm condition to those people who wouldn’t normally be alerted to a fire by standard audible-only devices such as sounders and bells. Why do Hochiki offer VADs? The disability discrimination Act of 1995 made the inclusion of VADs mandatory in all public buildings, specifically in areas where people with impaired hearing might work in isolation, or in noisy environments where staff might be wearing ear defenders such as factories, foundries etc. Unfortunately, the Act made no stipulation in regard to the light output of a VAD leaving the market open to sub-standard devices. Therefore, in 2010, BS EN 54-23 was introduced to standardise the performance of VADs across Europe. This new the standard became mandatory for all VAD manufacturers on 31st December 2013. Today, all public buildings require EN 54-23 approved VADs. Our VADs have a whole host of features and benefits, making it the ideal solution for a variety of environments. The requirement for VADs will be identified as part of a risk assessment. As with other fire alarm system components, there are a number of challenges that must be considered in the layout, design and installation of VADs. One challenge is the illumination of the entire volume of the open space where the alarm must be visible. VADs must produce sufficiently intense light so that an individual located anywhere in the space, looking either towards or away from the VAD, would be alerted in the event of an emergency. The performance of VADs under the standard is assessed against a minimum required illumination of 0.4 lux on surfaces perpendicular to the direction of the light emitted from the device. W and C mounted categories pertain to specific installation heights and patterns of coverage – see the below table for more information. 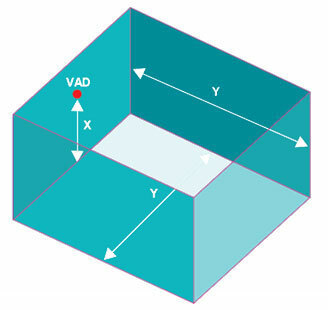 Within these two categories, the shape of the volume covered is fixed by the standard – a cylinder for the celling mounted category and a cube for the wall-mounted category. The dimensions of this coverage volume and the mounting height are specified by the manufacturer. 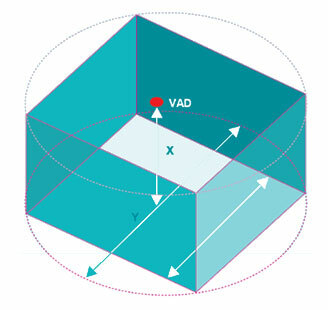 For all categories, the volume covered can be used to determine VAD spacing within the building. The Minimum mounting height allowable by the standard is 2.4m. For example, one of Hochiki’s wall mounted VADS has a classification of W-2.4-5. This means it should be mounted at 2.4m from the floor and will cover an area of up to 5m by 5m. An Intelligent Loop-Powered Wall Beacon with a high intensity LED and a custom designed free-form optic which produces a highly visible flash. Variants available in 5m, 7.5m and 10m area coverage. 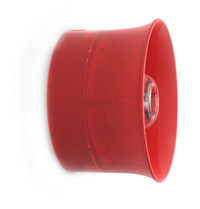 An Addressable Loop-Powered Wall Sounder Beacon, featuring an integral beacon within the horn which utilises high intensity LED technology. Available in Red or White case with either Red or White LEDs (four variants). The CHQ-WSB2 requires one of the following special bases; YBO-R/3 (RED), YBO-R/SCI (RED), or YBO-R/SCI(WHT-SNDR). Model YBO-BSB2 is an addressable loop powered Base Sounder with integral Beacon, innovatively designed to give a range of tones and volumes with a maximum output of up to 98 dB (A) (±2dB (A)) with low current consumption. 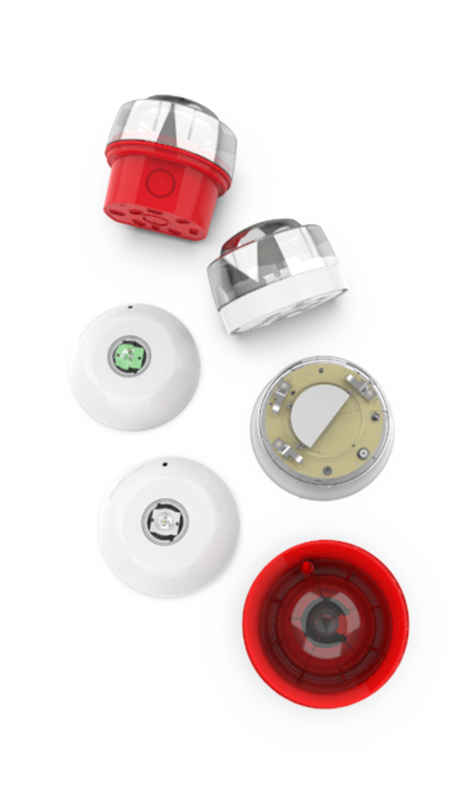 The unit is designed to fit to the Standard Base (YBN-R/3) or the Isolator Base YBN-R/3(SCI) and can be fitted with any of the ESP Range of Sensors, Beacons or remote Indicators. The unit can also be converted into a wall sounder beacon with the simple addition of a Cap (SI/CAP2). The sounder is Ingress Protection rated to IP21 and for internal use only. 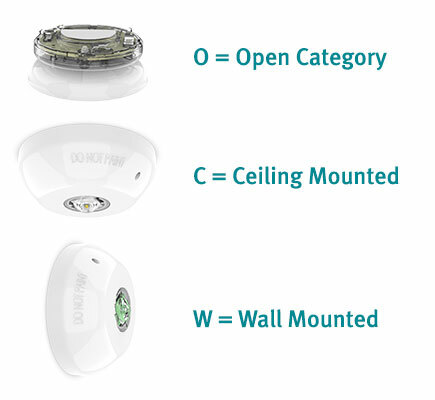 A range of Conventional Beacons, which can be used as wall or ceiling devices. All variants feature high output LEDs, advanced optics and an innovative lens design, providing outstanding omni-directional light coverage at low current draw. Coverage volumes include 194m3 and 92m3 (wall mounted at 2.4m) between 208m3 and 638m3 (celling mounted between 3m and 9m). The range includes 8 variants, which are determined by case colour (red or white), LED colour (red or white) and black box standard or weatherproof (IP65)). With the wide choice of VAD variants available it might seem a daunting task to identify the best unit for the application. Therefore we have devised this simple configuration table which allows you to source the correct VAD by answering questions and following the branches to the appropriate device variant. Simply select the VAD type, then the case colour and finally the LED colour. The ratings column allows you to check the coverage volume setting available. Coverage volumes are selected via the CIE*.